Shipping items to business associates and customers is at the heart of running a successful company, and when you rely on the commercial shipping experts at All Around Moving & Storage, you can rest assured that you will receive on-time service, professional treatment, and affordable pricing. Our commercial delivery experts understand how important it is for your business to get items sent out and delivered on schedule, so we use the latest in logistics, warehousing, and tracking technology to ensure prompt service. All Around Moving & Storage can handle commercial shipping jobs of all sizes, so no matter what type of industry you’re in, our team can get your items and products where they need to be fast. 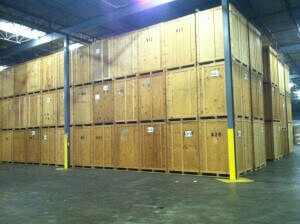 On top of that, our commercial shipping customers love our warehousing options. Whether you need to store pallets full of goods or a few rare, fragile items, we have commercial shipping and storage solutions for you. Our shipment tracking experts will work out an exact schedule with your specific needs in mind, and you’ll be provided with all available options so that you can make the right decision for your business. Once we’ve helped you craft a unique commercial shipping plan, you’ll have the ability to be notified through each step of the process so that you can verify acceptance. Shipment tracking is easy with All Around Moving & Storage. We provide our customers with simple options that allow you to see exactly where your shipments are in real-time so that you can have peace of mind in knowing that your customers are able to receive their items when they need them. We can also make adjustments to your commercial shipping needs if changes need to be made so that you can ensure that your customers and your business both enjoy the benefits of your hard work. Whether you need commercial shipping services across town or across the world, our shipment tracking and logistics professionals can help you get things done faster at a better price. The bottom line? All Around Moving & Storage is the ally you need when it comes to commercial delivery solutions in Michigan and throughout the globe. To learn more about our commercial shipping solutions, shipment tracking, and commercial delivery services, contact All Around Moving & Storage by calling 734-941-2280.